MIT: Reliving the ton with BT and Spud In the fourth edition of Moments In Time, Brian Taylor, Danny Frawley, Leigh Matthews and Michael Roberts head back to round 22, 1986, as they tell the story of Taylor's 100th goal of the season. 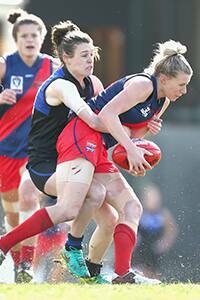 Diamond Creek's Christina Bernadi is tackled by former teammate and Melbourne University's Alicia Eva. Image: AFL Photos. Four of Collingwood’s AFLW foundation players will line up in the VFLW Grand Final on Sunday at Etihad Stadium. As VFLW powerhouse Darebin looks to claim its fifth straight premiership, Diamond Creek and Collingwood representatives Stephanie Chiocci, Emma Grant, Christina Bernadi and Amelia Barden will be out to spoil the party. For Chiocci, Bernadi and Barden, they’ll be chasing their second premiership with the Creekers after tasting success in 2012, where they defeated Darebin in the Premier Division. As captain of both Diamond Creek and Collingwood AFLW, Chiocci has played over 150 games for her VFLW club, and was recognised for her 2017 season with a spot in the VFL Women’s Team of the Year. Small forward Christina Bernadi impressed in the attacking half this season, kicking 17 goals from 14 matches. Barden played nine games for the Creekers, after starring in the midfield in Collingwood’s inaugural AFLW campaign. For fellow midfielder Grant, a premiership victory would cap off a successful first season with the Creekers, after she crossed over from the Bendigo Thunder in the offseason. The two teams met two weeks ago, where Diamond Creek defeated the Falcobs by 15 points to book its spot in the Grand Final. Both sides are stacked with AFLW talent, with the Darebin Falcons boasting VFLW Best and Fairest winner Katie Brennan, Melbourne defender Melissa Hickey and Carlton livewire Darcy Vescio. The Falcons have dominated the VFLW competition in recent years, and hold a favourable record over the Creekers, particularly in Grand Finals. From 2013 to 2015, the Falcons proved too strong for Diamond Creek, claiming a three-peat of VFLW premierships over their arch-rivals. Last season, Darebin overpowered Melbourne University, taking out their fourth straight premiership. Tickets to the match are available at Ticketmaster. The VFLW Grand Final will kick off a great day at Etihad Stadium, where Port Melbourne and Richmond will battle for the VFL Premiership, followed by the TAC Cup Grand Final.